CLERMONT, Fla. -- At 6,183 yards from the tips, the Kings Ridge Course at Kings Ridge Golf Club might not sound like a challenge, but it is. The course might not play long, and its wide fairways might not be too intimidating, but it isn't as easy as it looks. 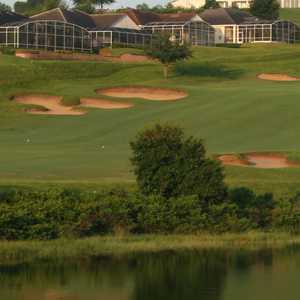 Kings Ridge Golf Club is located about a half-hour from Orlando in what Florida considers a high-terrain area. 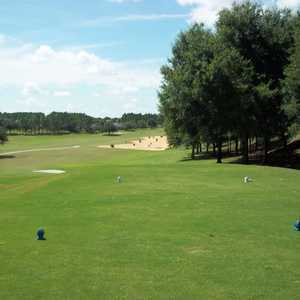 Kings Ridge Golf Club is in Clermont, about a half-hour from downtown Orlando without traffic, and it's in what Florida considers a high-terrain area. There are elevated greens, large drops off the tee, and even the occasional blind tee shot. The Kings Ridge Course is right across the street from Legends Golf & Country Club, another Clermont course that offers changes in elevation. 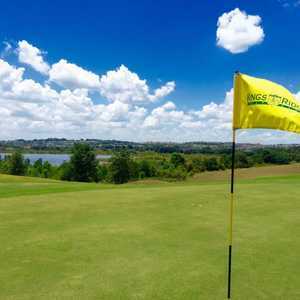 An ambitious golfer can make a real day out of playing golf in Clermont. It is a bit out of the way from the Disney courses and the dozens of other layouts that are close by, but Kings Ridge offers a great challenge from typical Florida golf. Kings Ridge Golf Club also offers the Ron Garl-designed Ridge Course, which plays only 3,584 yards and has 15 par 3s and three par 4s. It's a great warm-up course if you get out early, have a quick bite at the clubhouse, then get out and play the Kings Ridge Course, then head across the street to The Legends. That means playing 54 holes of golf in a non-typical Florida golf setting, but it's worth the golf marathon. Clermont itself doesn't offer much in terms of entertainment, so it might not be a good idea to spend more than a day there before going back to Orlando. The Lloyd Clifton-designed Kings Ridge Course is challenging because of its tight greens. Tee shots go uphill, downhill and every other way, but it's pretty easy to stay safe. The rough isn't too rough, and there's no water on the course that comes into play. Since the course plays short (the longest hole is the 512-yard 15th, but that is an aberration), most of the holes are driver, mid-iron. That's when it gets tricky. The greens are small. They aren't too difficult once you get there, but they are tough to hit if the irons aren't working. The 506-yard opening hole is a par 5 that has been recently lengthened. It's long and tough and, like most holes on the Kings Ridge Course, plays to a dogleg. Curving the drive is key at Kings Ridge to set up the approach. Otherwise, just try to drive it straight with a long iron or a hybrid to set up a long approach. Most of the holes play pretty much the same, but No. 7 is the longest par 4 on the course, a 445-yard hole with a dogleg left and trouble to the right. "It's a tough course, but if you can hit the greens on the approach, you'll be OK," said Mike Corrigan, the golf manager at Kings Ridge Golf Club. "If you can hit it far off the tees, you have an easy approach. We aren't very long, but the tight greens can still cost you." The blind tee shot on No. 12 is the toughest on the course. It's a 368-yard par 4, but signs tell you to have a spotter up ahead to make sure the fairway is clear. The closing hole requires a long tee shot over trees unless you can play it left to right. Play it too far right and it will roll deep into the marsh. Kings Ridge is not as tough as The Legends, but it has its fans. "I play both of them and it's always fun, especially the views," said Clermont's Jim McDonald. "It's not going to break you." McDonald's 18-year-old granddaughter from Pennsylvania, Angie Wickerhouse, is learning the game. She said Kings Ridge reminded her of the courses back home. Kings Ridge offers its own golf academy for lessons and an ample driving range and large putting green. One thing to know, though, is that there are a lot of long trips between holes. It meanders through neighborhoods and, while the homes don't come into play very often, some of the drives between holes are longer than some of the drives off the tees. If you want to pack in 54 holes in a day, this is a great course. Mix it in with the far shorter Ridge Course at Kings Ridge Golf Club and go across the street to The Legends to get away from typical Florida golf for a day. It's worth the trip to Kings Ridge as a package deal, but make sure to mix it in with The Legends.